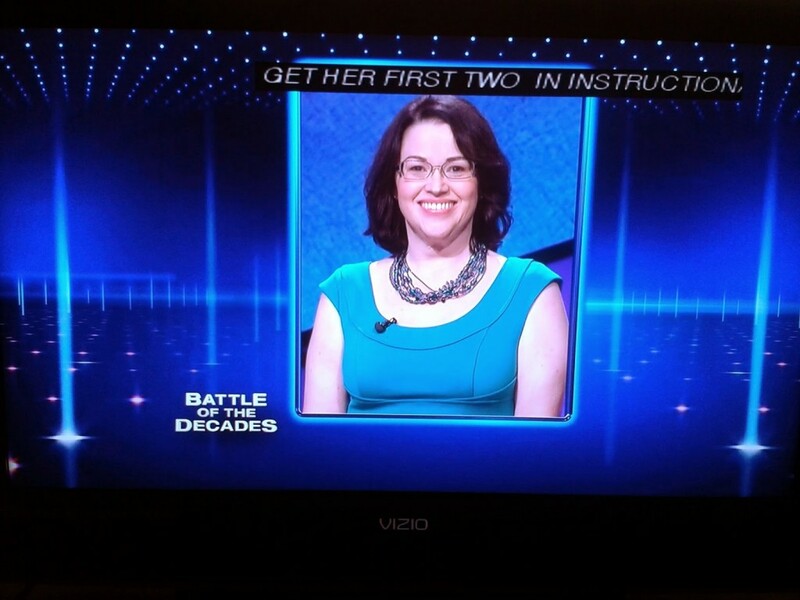 I don’t know about you, but these Battle of the Decades finals have sure snuck up on me. Before we get into it, my Coryat for the weekend rerun was 26200 (30400 without negs). The episode originally aired 1-18-13, and the first time I played my score was 25000 (30800 without negs). Since I had drained my Delta frequent flyer miles to go to this conference (read my account of it here and here), I flew from Kearney for the first time, on Frontier Airlines. It went well but know this: You will not get something to eat or drink on Frontier flights! 🙁 And I still can’t explain this: When I was going to buy something and asked the stewardess, she mysteriously disappeared and never did explain, even whenever I made eye contact with her later. That was from Denver to Los Angeles. As I mentioned in a previous post, Preston Nicholson was on that flight too! I’d seen him waiting by the gate but wasn’t 100% sure, so I didn’t approach him. After we landed I stood up and looked around for him (that is, whoever looked like him), and he said my name. He was only a few rows behind me. 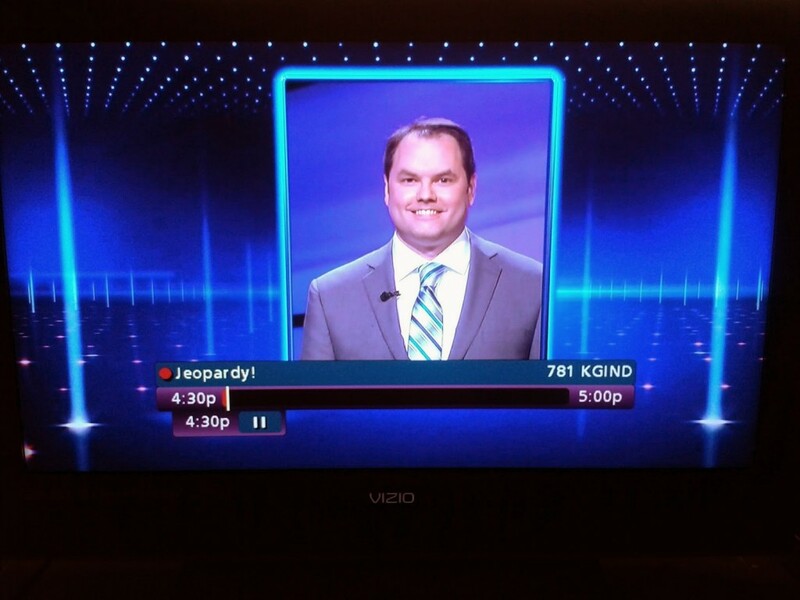 I was blown away when I got to my hotel – the guy checking me in not only remembered me but that I write a blog about Jeopardy! And I hadn’t even stayed there in January for the 1990s/2000s episodes, so I hadn’t seen him since December. I didn’t even remember telling him all that. Unlike whenever I’d watched episodes from the studio audience in the past, I took it easy that morning and arrived much later. I knew since I was a production guest (as opposed to a ticketholder) I’d be getting in no matter what. In fact, there were no ticketholders in the audience for these finals. Only production guests and contestant guests. I mean that’s pretty special. Remember Lillian and Randy, Mark Dawson’s guests last time? They’d told me they were coming back for these episodes, but I saw no sign of them outside the studio. I had been planning what I’d say to Lillian when she’d try to drag me to lunch (I don’t like to leave during the break), but I didn’t have to worry about that. I did see Michael Rooney, Cliff Galiher and O’Brien’s fixture Mark May. Mark was Tom Cubbage‘s guest! I also saw the lady who’d been described to me on a previous occasion as Brad Rutter‘s “agent.” I also saw the man “Joe” who attends every taping. I sat by him in the studio, as well as who turned out to be India Cooper‘s husband. 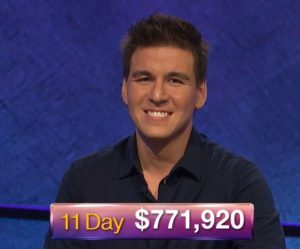 Joe will never see this because he doesn’t do Internet stuff, but he is a wonderful companion for studio audience Jeopardy! watching! I sat in front of an angelic little boy who turned out to be Shane Whitlock‘s son. The kid stole the show everywhere he went, both days. The next night at the party after the taping, Shane’s wife joked “Sorry” that I had to sit in front of him. I was only worried at the very beginning when he made noise while we were supposed to be quiet. Otherwise he was fine. I was surprised when he rested his head on my hip like it was nothing! Bill MacDonald had joked he hoped the boy could “overcome his crippling shyness.” I told Bill how the boy raised his hand to ask Trebek a question during this episode, and when called on he said “I think I saw you in a commercial, Alex Twebeck!” Later on when the audience could ask questions, a woman begged Mr. Trebek to come visit her workplace, some kind of nursing home, because he has a lot of fans there. This woman would not take no for an answer, and while he didn’t say “no” explicitly, it was clear he would never be coming! Who else did I see waiting to be let in to the studio that first day of taping? Jerome Vered, in a baseball cap! Jerome’s a lot of fun in the studio audience too. He’s so engaged in what’s happening! He, Cliff and Michael may take more notes than I do. I also saw a guy with a scarf wrapped around his head. I guessed he had some kind of injury or couldn’t stand the light for some reason, but in fact it was just going to be a surprise to him where he was! I wonder when he figured it out. I did not see the “Mel” who gives us the rousing informational speech as we wait, or the Jeopardy! page who knew my name last time and put me in the front row. I’m not being lazy; I just don’t feel the need to list this week’s contestants. I hope that’s okay with you. Happily, we were spared the images of these contestants from their original runs. Johnny Gilbert mangled the pronunciation of Leszek’s last name, and it had to be redone later. Johnny said seriously, “I need [contestant coordinator] Robert.” Someone said, “He’s on his way!” Speaking of Johnny, Jerome had me guess Johnny’s age. When I was in the process, we had to stop talking and we never got back to it. That page to which I link above indicates he’s 90! Imagine you were in the studio audience (like I was). What would you have thought of Roger’s chances, seeing these contestants at their lecterns? Leszek seemed the fastest on the signaling device out of the gate. No one else had responded yet when he found the Daily Double in A Brief History of Time. 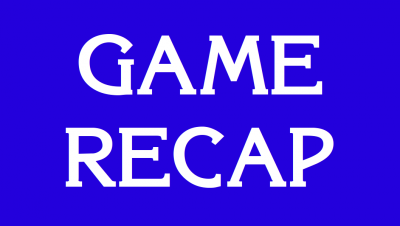 Leszek wagered it all on this clue: “Israeli forces destroyed Egypt’s Air Force on the ground on June 5, 1967, the first day of this war.” Leszek knew this cold, and Mr. Trebek said he was on a roll. Then he answered the last clue in the category correctly, sweeping it! Leszek appears to have come to play! You couldn’t tell in his interview, but Roger fumbled his answer to Trebek and had to say he was going to start over! It was so messy I didn’t think they’d be able to edit it well. But they did. Now that Roger has revealed that he is engaged (and isn’t that awesome? 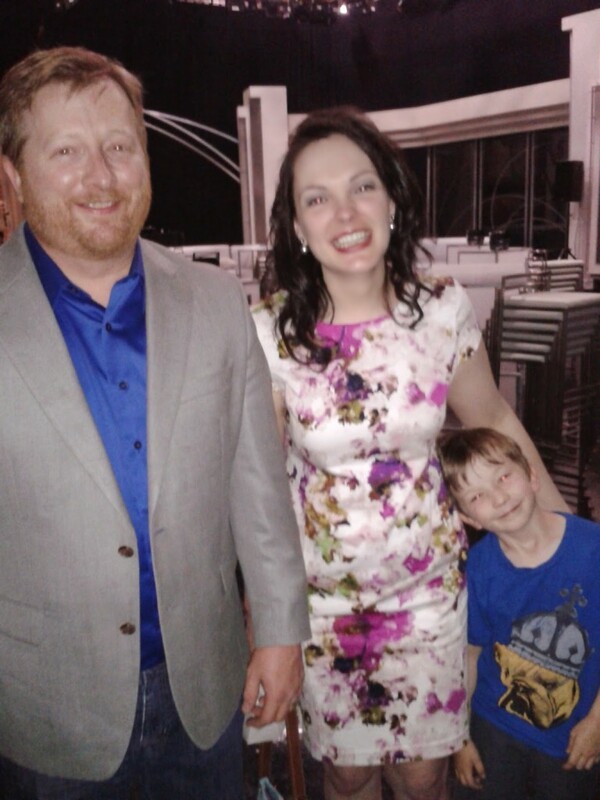 ), I can tell you that is his fiancee over my shoulder in this picture of me and Ken Jennings. It was so exciting to hear Roger tell this story from the studio audience. Mr. Trebek said after the break “not too many misses.” Maybe not at first, yeah? I have that Roger reacted but I didn’t indicate what the reaction was! Leszek had a painful neg at 2000 to start out the round. Then Roger negged on the next clue! Roger found the first Daily Double of the round in A Brief History of Time. I love watching him do his thing on these. Naturally, Roger wagered it all on this clue: “Following Einstein, in 1908 Hermann Minkowski proposed the idea of 4-dimensional this hyphenated term.” This seems like something in Roger’s wheelhouse. And he got it! I was pleased when Roger found the next Daily Double too, in Lesser-Known Americans. So what would Roger do this time? He wagered 5000 on this clue: “With a mark of 5’6″ in this event, in 1948 5’7″ Alice Coachman became the first African-American woman to win Olympic gold.” Roger got it at the last second! Trebek said Roger was scaring him, and Roger was sure scaring me too. Roger said that was scaring him more! I had crossed my fingers on this Daily Double, and I noticed another guy in the audience did too! Later, he could be seen urging Roger by moving his arms like he was riding a horse. I found out later the woman sitting next to him was Roger’s fiancee! They must’ve all been together. 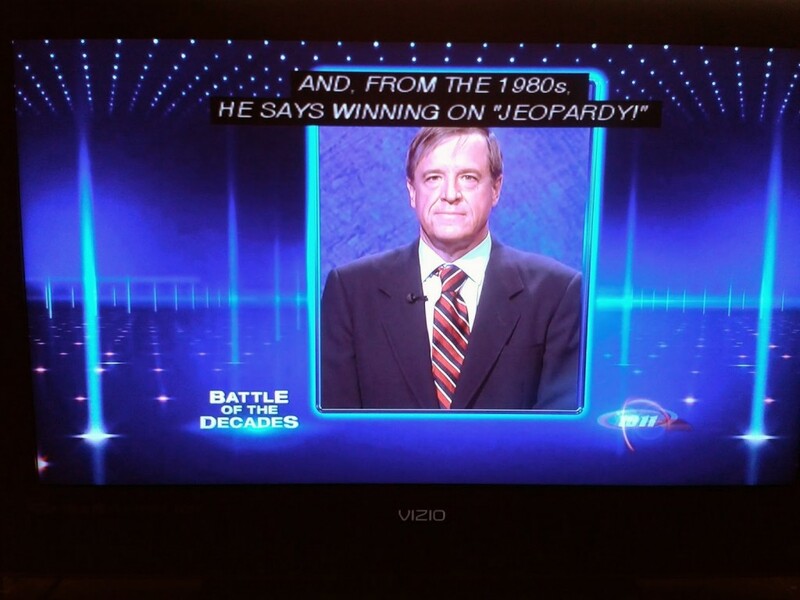 The Final Jeopardy category was Word Origins. While it was called 4-Letter Words, the subject was similar to the Final in Robin’s quarterfinal episode! This is the clue: “This word for a timid person comes from the last name of a character in a 1920s newspaper comic called ‘The Timid Soul. '” I freaked out from the audience. I had known what it meant but probably not its origin when I looked it up maybe in the week or so before seeing this clue, after talking with my family about this. Robin didn’t get this right and lost everything. (Remember, there are 4 wildcards available for the semifinals next week.) Leszek was wrong but didn’t wager anything. Roger was right and added 1078. He heaved a sigh of relief. I guess I cheered a little too hard for Roger, as India’s husband and a Jeopardy! staffer asked if I was his fiancee! So since Robin talked about what she might wear in her Q & A, what do you think of her outfit? Robin’s daughter Alison said the next night Robin looked like a presidential candidate. And hey, now you know that Robin had not advanced when she played the O’Brien’s pub quiz that night. We’ll find out everybody else’s fate later this week! I didn’t track my Coryat since I saw this game already, but I’m curious to see yours. One year ago: Sigh. But not for the reason you think!